The Bike-Sharing Startup That's Helping Bring Bikes Back To China's Busy Streets : Parallels MoBike, China's first bike-share company, is worth $3 billion. "I personally like riding bicycles," says the company's 35-year-old president Hu Weiwei. "I was thinking, 'How can I bring bikes back?'" 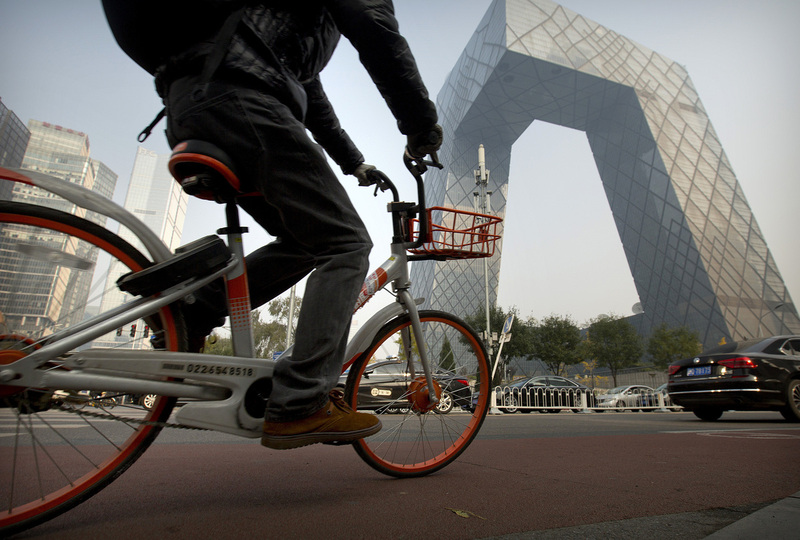 A man rides a Mobike bicycle past the CCTV Headquarters building in Beijing. But China's push to lower emissions, and the sheer impracticality of driving on traffic-clogged streets, means that in some places bikes are having a second coming — in the form of bike-shares. 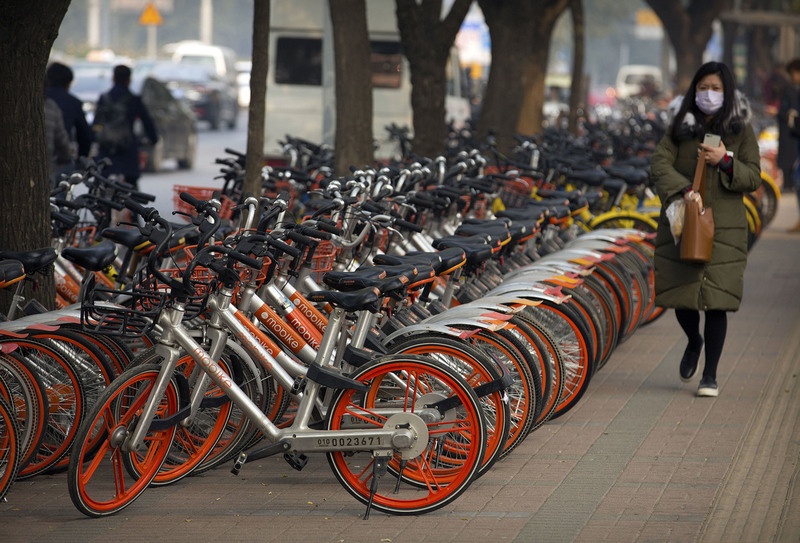 The new image of the streets of Beijing is a millennial riding a sturdy, brightly colored bicycle — orange, yellow or green, depending on the brand. 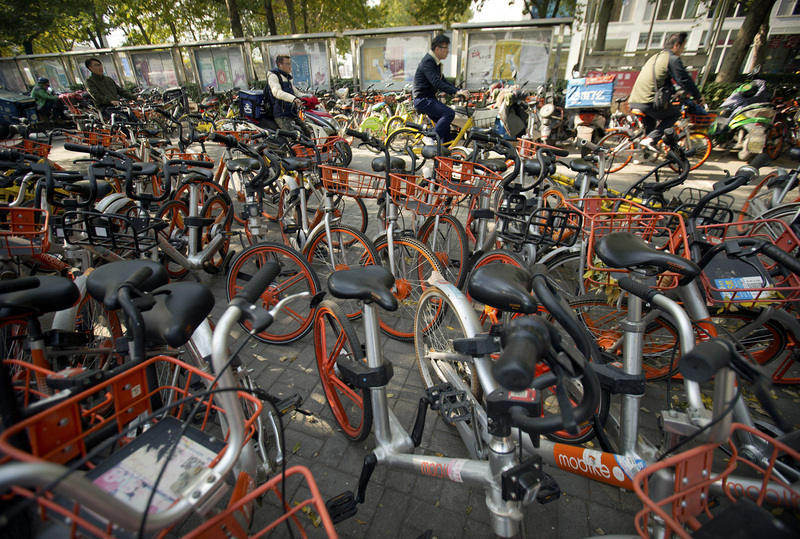 More than two dozen bike-share companies are operating in China now. A man prepares to unlock a Mobike shared bicycle parked along a street in Beijing. There are between 16 million and 18 million shared bikes on China's streets — dockless, with an automatic electronic wheel lock. Once locked, the bikes can be safely left unattended, and they are — thousands at a time. On busy city corners, they are tossed into messy piles, frame upon colorful frame. A MoBike app allows you to locate a nearby bike. You unlock it by scanning a QR on the frame with a free app on your phone, and pay for the use in half-hour increments, with no signup fee required. In some parts of Beijing, the sidewalks are so crammed with piled-up bicycles that they force pedestrians into the streets. The glut has led to a ban on new bikes. 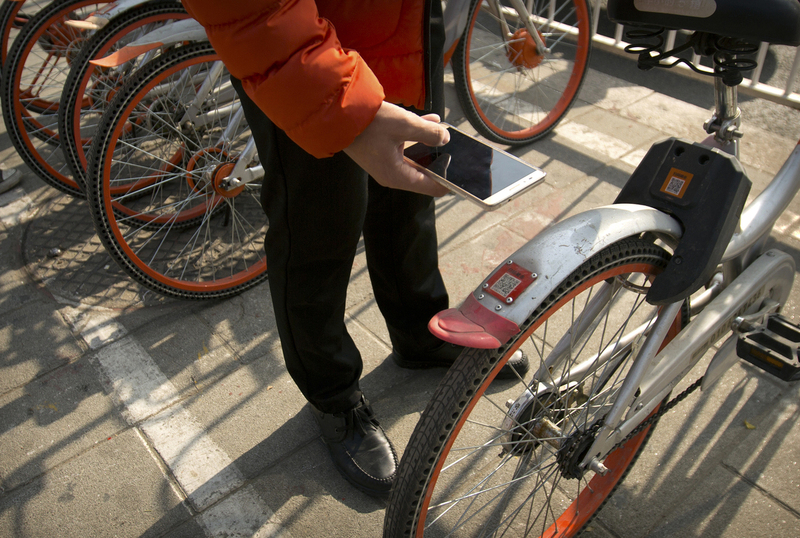 A customer uses a cellphone to scan a QR code, which allows them to unlock one of the shared Mobike bicycles parked in Beijing. To Hu Weiwei, all this is simply the natural outcrop of her company's success. Two years ago, she founded Mobike, China's first bike-share company. The concept proved itself quickly, she says. "China is leading the world in many ways. We have a good manufacturing base, but we aren't just that. We have innovation," says Mobike's president Hu Weiwei, shown here in June. "At the beginning, nobody could believe it, how these bikes could work without being stolen," she says in a mix of Mandarin and broken English. "We've learned that there's a pattern to it. When we first launch in a city, there are always cases of the bikes being stolen. They don't realize we have technology to track the bikes. But then they learn." The founder and president of this $3 billion company is 35 — old enough to remember something of China's earlier bicycle era. "It's a very nice memory, actually," she says. "I personally like riding bicycles, and I was thinking, 'How can I bring bikes back?' "
Weiwei grew up in a modest home in a town in eastern China. Her parents are woodcarvers who make decorative doors. After leaving her hometown, she worked as a business journalist before catching the entrepreneurial bug. 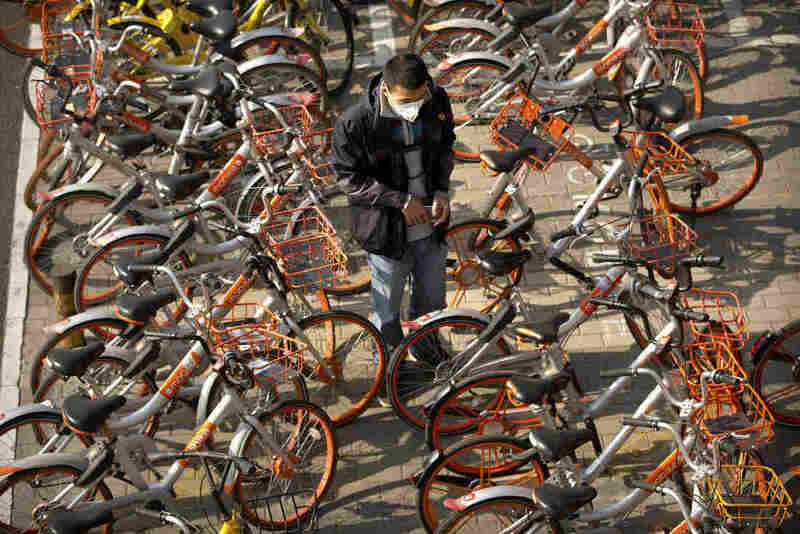 A woman walks past Mobike shared bicycles parked along a street in Beijing. Her story speaks to those of millions of China's citizens who have followed their dreams from the provinces to the cities — with no promise of success. "We're in an age of exploration now in China," Weiwei says. "Unlike our parents, people of my generation want to move to the mega-cities, and we often choose to stay here. The pace of life is fast. We can watch whatever we want, unlike in my parents' generation, when everyone watched the same soap opera at the same time. There are many stars in the sky now." 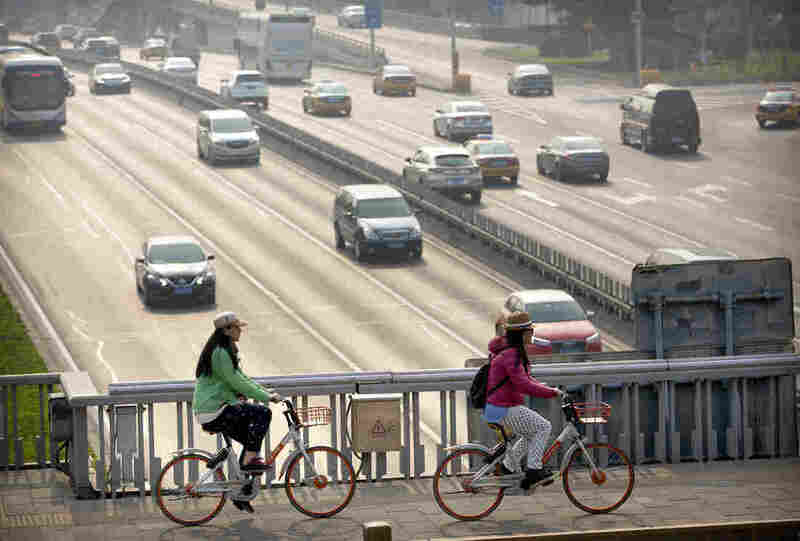 People ride Mobike shared bicycles along an expressway overpass in Beijing. Against the chill of a damp October night in Beijing, Weiwei wore a black fleece bearing her company's logo, a casual outfit that would fit in well in Silicon Valley. She joked with a colleague that she hadn't had time to wash her hair that day. She works up to 20 hours a day, she says. Mobike does not yet turn a profit, though she insists that's a choice, saying the company is focused on growth right now instead. Having raised more than $900 million from investors, including Internet giant Tencent — one of the world's largest Internet companies, which also boasts a close relationship with China's authoritarian government — Mobike appears to be on fairly solid ground. But it faces tough competition from half-a-dozen bike-share companies in China and worldwide, including California-based Limebike, which launched almost simultaneously with Mobike 18 months ago. People ride bicycles and scooters past Mobike shared bicycles parked along a street in Beijing. Mobike is still very much in startup mode. To prospective employees, it tries to make a virtue out of its long days, ad hoc environment and disorganized office space. In its cramped Beijing complex, some employees have set up laptops in the lobby and in conference rooms, for lack of other space. They work shifts late into the evening; the company has lunch and dinner buffets on offer in the office every day. Weiwei's British colleague Chris Martin, who is leading the company's international expansion, says that conducting interviews with potential employees around the world clarified something for him. "We had candidates from overseas asking for book recommendations on Chinese business culture, and we realized that we couldn't think of a single Chinese thing about the company," he says. "We decided that the perfect fit for our employees is not Chinese culture, but rather startup culture." This week, nearly 30 American CEOs accompanied President Trump to China, urging Beijing to open up its market to foreign companies to try to repair the trade deficit. Chinese companies like Mobike are just as eager to get access to the American market. So far it has expanded into several countries, launching in the Netherlands this week to go with operations in Singapore, Italy and the U.K. Although it has only made it into one American city thus far — Washington, D.C., where it finds itself head-to-head with its American challenger, LimeBike, and others — Weiwei refuses to be disheartened by her competition's home team advantage. "China is leading the world in many ways," she says. "We have a good manufacturing base, but we aren't just that. We have innovation." Sheer determination has brought her this far. As tired as she looks heading back into her shared office at 8:30 at night, she still sounds energized by the challenge. Miranda Kennedy is a senior editor at Morning Edition. You can follow her on Twitter at @mirandatk. NPR producer Alyssa Edes and contributed to this story.